Description The story of the WASP HX-2 starts with the development of the HX-1 prototype. This machine received its FAA flight approval on 1 March 2006 in the experimental category, and was first revealed to the public (static and hover only) in April 2006 during Florida’s Sun 'n' Fun in Lakeland Fly-in. However, in May of that year, the HX-1 crashed during a test flight with the Helowerks owner, Tony Pena, at the controls. The cause of the accident was a pilot initiated engine shut down, with Pena erroneously toggling the fuel solenoids off. This accident was the trigger for the further development of the HX-1 into the HX-2 version, with much more emphasis on safety, with crash resistant seats and landing gear to the fore. The WASP HX-2 uses composites extensively and is turbine powered. It was registered on 19 August 2009 as the N690HX. At this point (2012), no units have been sold and Helowerks is looking for investors. The story of the WASP HX-2 starts with the development of the HX-1 prototype. 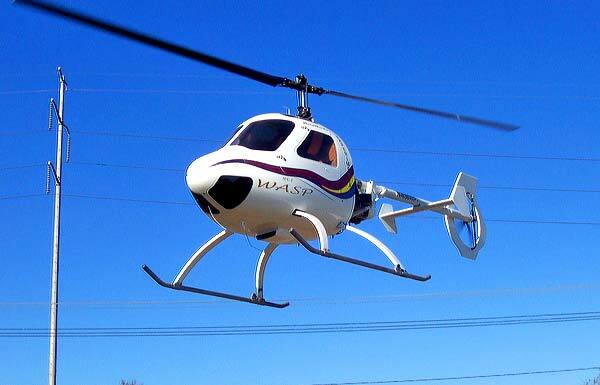 This machine received its FAA flight approval on 1 March 2006 in the experimental category, and was first revealed to the public (static and hover only) in April 2006 during Florida’s Sun 'n' Fun in Lakeland Fly-in. However, in May of that year, the HX-1 crashed during a test flight with the Helowerks owner, Tony Pena, at the controls. The cause of the accident was a pilot initiated engine shut down, with Pena erroneously toggling the fuel solenoids off. Do you want to comment the Helowerks HX-2 WASP helicopter?